BHS Order Picking Carts (OPC) are ideal for picking orders, moving merchandise, and simple ergonomic material handling. 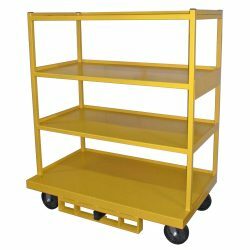 Invest in a BHS heavy-duty warehouse cart and enjoy durable, long-lasting service. The BHS Order Picking Cart comes in four standard sizes, but can be customized to specific requirements. The OPC is equipped with fork pockets to accept transport by lift truck, while casters allow the unit to be positioned manually. The cart’s lipped shelving helps contain merchandise while the open style frame permits visibility of contents from all sides. Whether unloading packages, counting inventory, stocking shelves, gathering parts, or picking merchandise for order filling, the OPC is designed to help get the job done efficiently. The OPC is specially designed to endure harsh conditions. Its heavy-duty steel construction and powder-coat finish help it stand up to the most extreme conditions without failing. BHS manufactures all of its products in a 128,000-square-foot, state-of-the-art manufacturing facility. Using both human and robotic welding, we can customize products to perfectly match your needs. We can even laser cut your company’s logo on the cart. Find out how much more efficient your warehouse can be with made-to-order material handling equipment. BHS warehouse carts are durable, practical, and highly customizable. For more information, contact your local dealer or call our sales team at +1 314 423 2075.